This cinnamon-y chocolate cake gets a pleasing tang from the inclusion of vinegar; and a wet, fluffy crumb because of shortening. 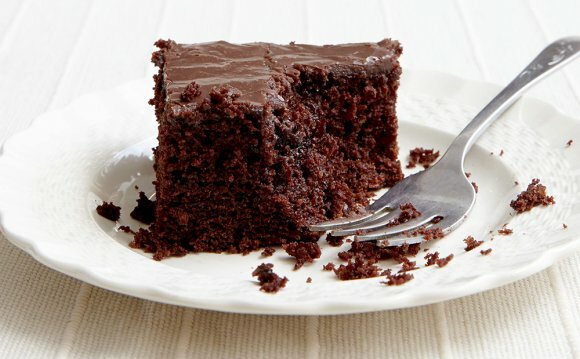 Make the cake: blend milk and vinegar in bowl; let sit until somewhat curdled, about 10 minutes. Heat oven to 350°. Grease a 9"x13" baking dish with shortening. Whisk flour, sugar, cinnamon, and baking soft drink, in a bowl; make a well within the center. Bring shortening, cocoa powder, butter, and 1⁄2 cup liquid to a boil in a 1-qt. saucepan. Cook, whisking continuously, until smooth, 5-7 minutes; allow cool off somewhat. Whisk in milk mixture and eggs. Stir wet ingredients into dry components until a smooth batter kinds. Pour batter into greased cooking pan and smooth top. Bake until a toothpick inserted into the center arrives clean, 25-30 minutes; let cool. Make the icing: Whisk confectioners' sugar and cocoa dust in a bowl. Simmer milk and butter in a 2-qt. saucepan over medium heat until butter is melted, 3-4 minutes. Whisk in sugar combination until smooth. Pour icing over dessert; allow set entirely, about thirty minutes.